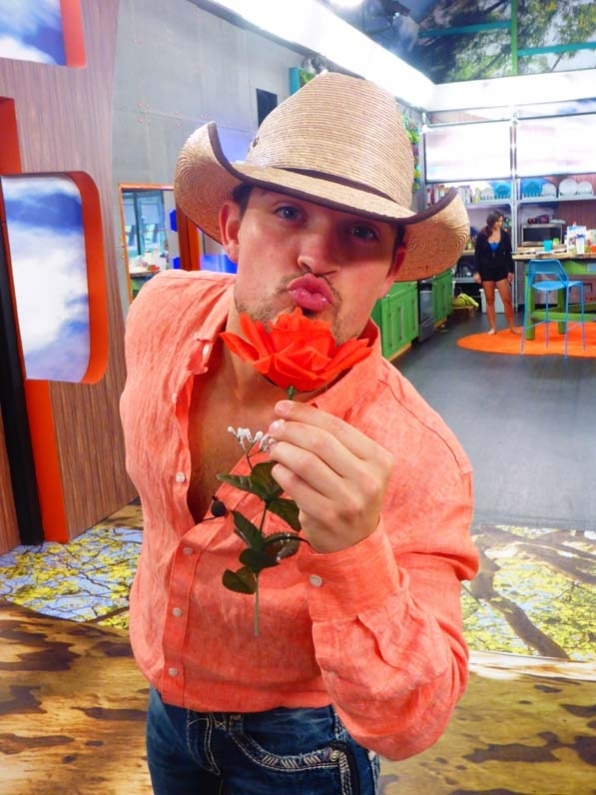 It is time for even more photos on Big Brother 2014, but this time is comes from the Week 10 HoH blog and camera time, which means time for Caleb to get all done up in his “Beast Mode Cowboy” gear and show off for the single ladies! I just have to giggle reading his blog and seeing these pictures. He seriously is full of himself, but I guess you have to be to get on Big Brother 16! Check out the photos and blog below in our Big Brother 2014 spoilers! Caleb will be another one of the HGs that might be in for a shock when he leaves the Big Brother 2014 house. He seriously thinks he is one of America’s favorite players and everyone loves him. He does not have as much hate as others in the house, but he isn’t a big fave out here either. I think he will have the ladies throwing themselves at him, regardless, but that is what happens when someone gets on TV and people try to get some of that fame! Caleb didn’t say a whole lot in his HoH blog, but a simple mind has simple things to say, huh? His videos are hilarious and his tweets, as he mentions The Bomb Squad blowing up things and he is single and wants dates after the show! If you want to see it, check it out here! NICOLE the only one worth the camera time. Was just watching BBLIVE and Nichole wanted avocados, but when she went to get them the door was locked and all that could smelled was CHEESBURGERS! I could care less if they had a brawl. BUT no harm to Nicole. NONE. h e l l because everyone will be following you! real mayo and tomatoes a leaf lettuce would be my taste. About 3,000 calories, but soooooo good! Do you have Swiss Chalet in the U.S.? I really like that too with sweet potato fries – that’s where I’m going tomorrow. Too many gutless wonders on this show to appreciate a Donny, Nichole and even one or two of the very early evictees. I hope for Nicole anyway. I feel bad for her the way she has been treated and I would love to kick the living crap out of Christine for treating her and Donny the way they where treated. Could be difficult with the restraining order but dream on Caleb. Well Derrick is a cop…maybe he can hand Caleb the restraining order…but me thinks that Caleb would probably think it was tickets for a trip around the world…His world. Todd, I know you flinch every time you post pictures – wondering how badly you’re gonna get blasted because we just despise looking at these people! That said, at least a certain person didn’t hog ALL the hoh photos! Though, anyone else noticing that Caleb is truly “posing”? He’s really delusional about what a star he is (not)!! He’s more like a black hole instead of a star. He is going to need to get dressed up he is headed out the door soon as well. LOL!!! A very scientific analysis! There were 46 total pictures. I picked 24 of them and Frankie was probably in the rest of them I did not pick lol. He took over the camera! They were pretty good, maybe that’s why. A million grateful thank yous!!! He should be called boasting Caleb. He is far from a real cowboy. He is a joke! delusional as FrankiejGrande.. the infamous. Poor Nicole is completely snowed by Derrick – she honestly thinks he’s a friend and that, if not for the “house” wanting her out, he would vote to keep her. I’m still wondering if he isn’t holding out to win comps late in the game so he can use THAT as justification for his game play. I just don’t think he’s as bad as he’s appeared. I thought of that as well Lilly. He had to go to the police academy and that is not easy. I hope Nicole don’t go home. But we all know she will. Derrick a friend yea right look how he stabbed Donny in the back. Hopefully this post goes through. I haven’t posted lately, because they keep moderating my posts and then none of them go through. I don’t understand why, because I try not to offend anyone or post anything that would be considered mean or rude. I don’t like posting and then it gets lost in translation. Anyways, I am excited about tonight, but even more so for tomorrow! And here I was thinking, gee I haven’t heard hide nor hair from Shirene lately, guess she’s off having a good time somewhere nice tee-hee. What’s happened to you has happened to me and probably all of us. Got this one A-OK. I’m looking forward to tomorrow big time…double eviction! whoo-hoo!!!! This is surly a “talk to Todd”. First up in the last several days the worst swearing was left to fly, let alone inferences. I am inclined to say by virtue of that alone, it is something technical, not what you are writing. Seriously, there were some real fully spelled out name calling that was left to post and not “moderated”! Good luck, hope he fixes it for you. I know what you mean. That’s why it’s so frustrating when it happens to me. If I cursed like a sailor on here I’d just accept it and move on, but I don’t, and that’s what gets me. OH well, whatcha gonna do? It is what it is. Caleb’s hot. Too bad he’s such a redneck. I can handle redneck. Delusional egomaniac is a little tougher! And his fashion statement is one he should not be making. He thinks he is. ????? No self-respecting redneck would claim him as a member of the tribe–he would definitely be voted off the ranch. Ok off subject I just worked 12 hours is who ever can going to be in the chat room or is any one watching ? I still can’t figure out how to get in the chat room. Also, getting toooooooo old. Ugh, Frankie is still there and CBS might as week get rid of their “CBS CARES” crap. They don’t care about women at all.